From Kotobukiya. Kotobukiya's ARTFX+ lineup of beloved characters from the STAR WARS saga continues with Poe Dameron & BB�-8 in a two pack set! BB�-8 is an entirely new sculpt from the previos R2�-D2, C�-3PO & BB�-8 set, with new parts and features such as the 'thumbs up' flame armature and magnet� attached head. 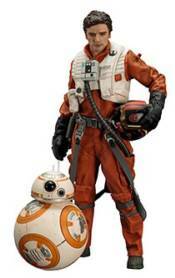 Display Poe Dameron with his helmet on or removed and tucked under one arm with the additional parts. Display alone or alongside other Star Wars The Force Awakens statue kits from Kotobukiya!